An array is a collection of data having the same data type and the entire collection can be accessed using the same name. A specific element of an array can be obtained based on the index of the element. Each data in an array is known as an array element. The reason that we need "Arrays" concept in programming can be explained using an example. Let us consider the tracking of business sales for 2017. It is necessary that the sales receipts have to be filed. This can be done by having a separate file for each month, but it would be more convenient if we can simplify it by maintaining a single folder with 12 different files, one for each month. Let us imagine the designing of a program to keep track of the business sales. Conventionally speaking, the program could declare 12 separate variables for each month's total sales. This is analogous to having 12 separate files for your receipts. But with the help of arrays, the total business sales can be stored in a single array of 12 elements. This is analogous to filing your sales receipts in a single folder with 12 files. This declaration denotes that an array of name "sales" is created with 12 elements. Each element is an exact equivalent of a single int variable. The array elements are always numbered from 0, so the 12 elements of sales are numbered from 0 to 11 (including 11). Regarding the business sales program example, January's total sales would be stored in salesArray, February's in salesArray, and so on. 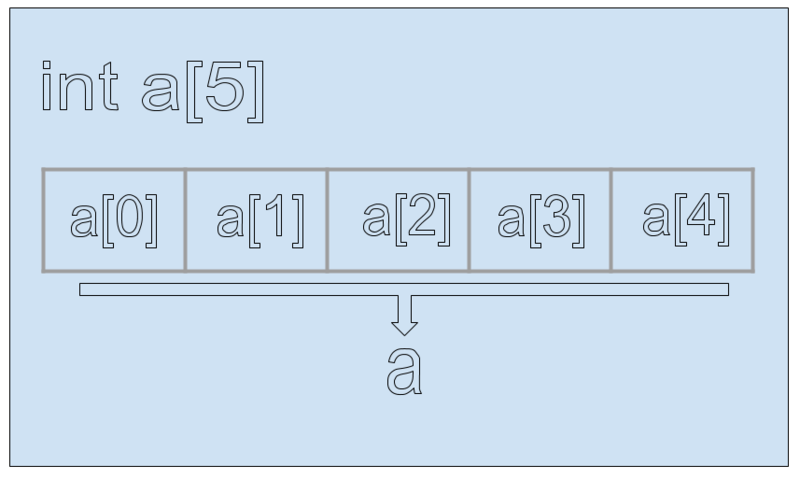 When an array is declared, some memory is allocated by the compiler to hold the entire array. The above statement sets the value at index 8 to value at index 10. In Arrays concept, the allowable indexes in an array range from 0 to (n-1) in an array of size n. Hence while trying to access a value at index n, the index will be out of range and hence produces erroneous results. When you run the above example program, the program prints the values in the predefined array one by one from index 0 to 11 ie., totally 12 values. The program starts with a comment that describes what the program is all about. This line declares an int value for iteration usage using for loop. This starts the iteration process. For every value of i, the value of i and the value of the element at position i is printed using "cout" statement. The resultant Output will be the same as in the Sample Output.